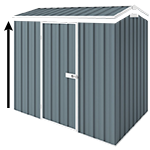 The EasyShed Garage Shed Range is perfect for homeowners who need a new garage or want to expand their storage space at an affordable price. These steel buildings offer a range of sizes and customisable options to make sure it suits your needs. This colour Garage Shed is the second largest model in the range and spans nearly 8 meters long. It has been designed to fit large equipment as well as provide room for a workshop. These sheds are delivered flat packed. You will receive all panels, parts and instructions in the kit. Choose from a variety of accessories on this page to customise your Garage Shed. You will be surprised how much of a difference some shelving, windows and guttering can make to your overall end product.